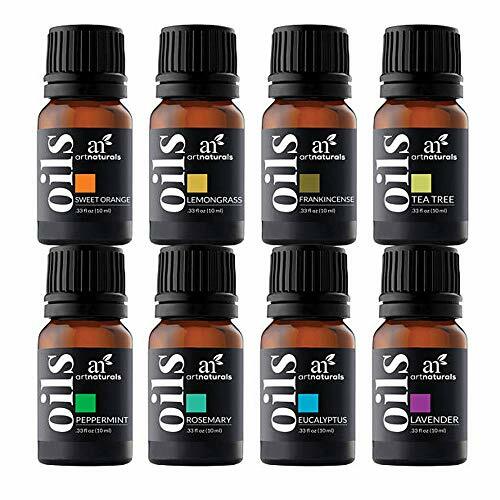 "Gift yourself—or those favorite people in your life—an aromatherapy shop in a box: Art Naturals’ Top 8 Essential Oils Set. Each of the 10 ml. bottles of essential oil provides healthy, natural benefits for skin and home. Frankincense Essential Oil calms, fights fatigue, and increases circulation. Used with a carrier oil, it helps heal eczema, psoriasis and dandruff, all alongside that lovely scent. Lavender Essential Oil’s delightful fragrance reduces stress and creates a warm and welcoming environment. Used with a carrier oil, it helps heal minor burns, cuts, insect bites/bee stings, eczema, dandruff, dry skin, and soothes anxiety. Eucalyptus Essential Oil used in a diffuser or humidifier, befriends the weary cold and flu sufferer, and a few drops in shampoo or conditioner revs up your scalp and fights dandruff. Lemongrass Essential Oil fights bacteria and other microbes, deodorizes, deters insects, and its fragrance lifts spirits and soothes anxiety and depressions. Peppermint Essential Oil used as directed, can calm indigestion, relieve sinus congestion and headaches, and rev up energy levels. Its anti-inflammatory properties make it excellent for use with a carrier oil to massage tired, achy muscles. Sweet Orange Essential Oil has a wonderfully uplifting scent, used in diffuser or vaporizer. Used with a carrier oil and as directed, it perks up dull skin and is healing for mouth and gums. Tea Tree Essential Oil is in a class by itself when it comes to fighting infection, fungus and acne—and blends to become a phenomenal beauty product as well. Rosemary Essential Oil is invigorating, refreshing and stimulating. Used with a carrier oil for massage, it helps to relieve arthritis pain. Its antiseptic properties make it a natural healer, and it is believed to help improve memory."